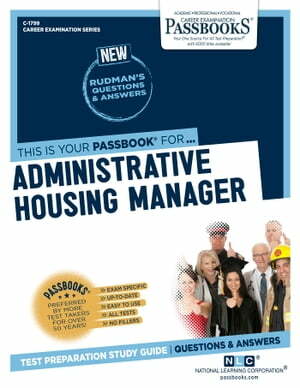 Collins Booksellers - Administrative Housing Manager by National Learning Corporation, 9780829317992. Buy this book online. The Administrative Housing Manager Passbook® prepares you for your test by allowing you to take practice exams in the subjects you need to study. It provides hundreds of questions and answers in the areas that will likely be covered on your upcoming exam, including but not limited to: communications and human relations; administration (including supervision and management functions, decision making and techniques of apportioning time) relevant to housing management; personnel management techniques and rules, and training methods and techniques; reading comprehension and interpretation of pertinent material; budget preparation and administration; government operations and relationships; and more.